On my way to New York a couple weeks ago, while on a layover in Kansas City, I ordered a plate of barbecue chicken, stripped it of its sauces and flavorings, and found that Julia was right. My chicken essentially tasted … well, like nothing. 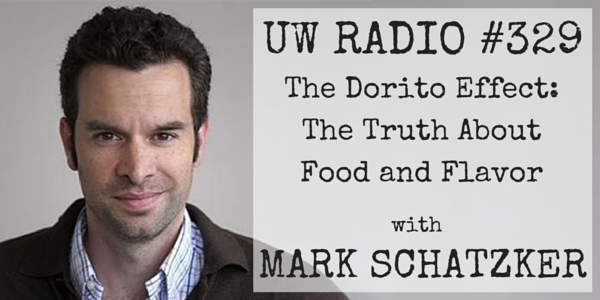 Award-winning food journalist Mark Schatzker, author of The Dorito Effect, might say my chicken had been “dorito-fied” — loaded up with artificial flavors to cover up the fact that what was once a delicious bird needing only a sprinkle or two of salt and pepper was now essentially a blank slate. And it’s not just chicken. Beef, pork, and any inappropriately-fed animal have met the same fate. Yes, even organic. Fruits and vegetables, once bursting with flavor, are now plump with water and bred with yield in mind, to the detriment of taste and nutrition. And it’s making us fat (and hungry). Flavor dilution is the new normal. Meanwhile, the food flavoring industry has made a science out of covering it all up while engineering addiction at the same time. Mark’s book is hands-down the BEST book I’ve read all year. I read it twice, something I seldom have the time to do anymore. And I was beyond privileged to discuss his book with him in today’s episode of Underground Wellness Radio. This is must-listen stuff. Click the PLAY button at the top of this post to listen to the entire episode! See you next week with Dr. David Perlmutter, author of Brain Maker. This entry was posted on Tuesday, May 5th, 2015 at 11:44 am and is filed under podcast, wellness. You can follow any responses to this entry through the RSS 2.0 feed.